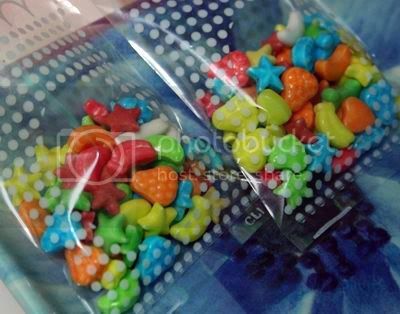 At the corner of Tabora/Ylaya, mini candies are being sold in packs. The small ones cost P35 each. You can repackage these by putting them in mini plastic packets (I bought mine at Chocolate Lover but am sure they're also sold in Divisoria or Quiapo or other baking supplies shops). The wonderful thing about these candies is that they're also differently-flavored according to color. 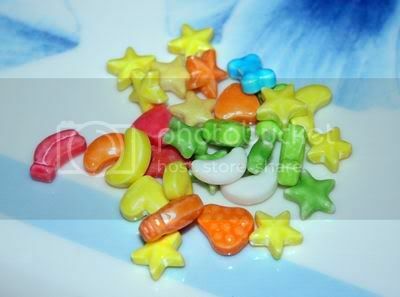 So aside from being cute and definitely eye-catching, they're also very interesting candies. Of course, I cannot be sure if they're melamine-free (though, since you wouldn't exactly give candies to babies, am sure the kids or adults who ingest them will be alright). 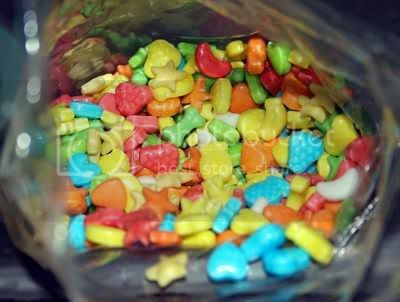 I just put about a spoonful of these candies in the mini packets and stapled that (for the first batch, I actually put stickers on the plastic packets first). I believe I was able to make 26 packs from one P35/bag. This is a cheap and cute something to include in loot bags or give away to kids (kids calling on your home and wishing you "Merry Christmas" perhaps?). And it isn't that sweet too.